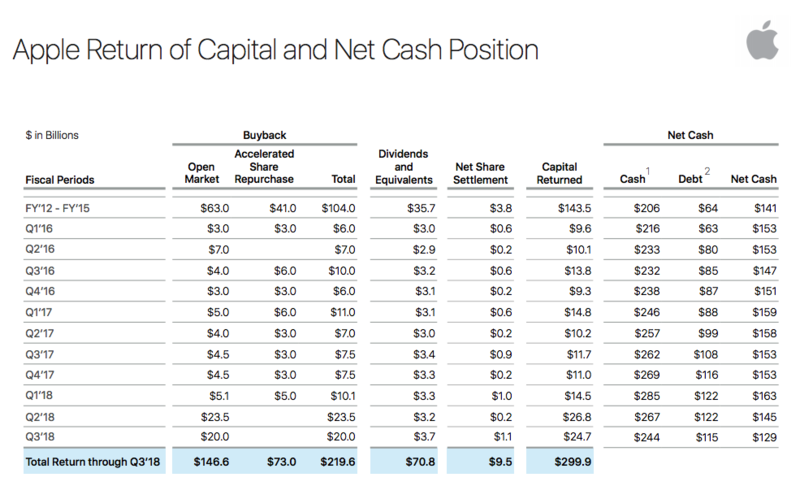 Apple (AAPL) will report its fiscal Q4 results tonight after the close. The options market is implying about a 5% move in either direction or about $11, which is only a tad rich to the average one-day post-earnings move of 4.3% over the last four quarters, and the 4.5% average move over the last ten years. With Amazon’s recent 20% decline over the last month, from its all-time highs, AAPL remains the only public equity on the planet worth more than $1 trillion. Despite the stock’s 6.5% decline from its all-time high made in early October, it is still up and astounding 29% on the year, showing very healthy relative strength to the Nasdaq Composite which is down 10% from its all-time highs made in late September, and the S&P 500 which is down 7.5% from its all-time highs, and only up 6.5% and 1.8% respectively on the year. We are raising our FY Q4 and FY 19 revenue and EPS estimates, largely due to richer ASP assumptions for iPhone and Watch. While Q4 18 results are not important on a standalone perspective, we are ahead of both consensus and guidance largely due to iPhone ASPs. Overall, we forecast Q4 18 iPhone ASPs of $800, vs consensus at $741, resulting in revenues of $63.3B vs consensus at $61.3B and EPS of $2.90 vs consensus at $2.77. For FY 19, we expect flattish iPhone unit growth and gross margins YoY, but expect notably higher iPhone ASPs ($813 vs. $775), which leads our revenue and EPS estimates to be above consensus forecasts ($291.3B, $14.15 vs. $280.6B, $13.64). That said, we believe that iPhone unit growth is likely to be the critical metric for investors going forward. 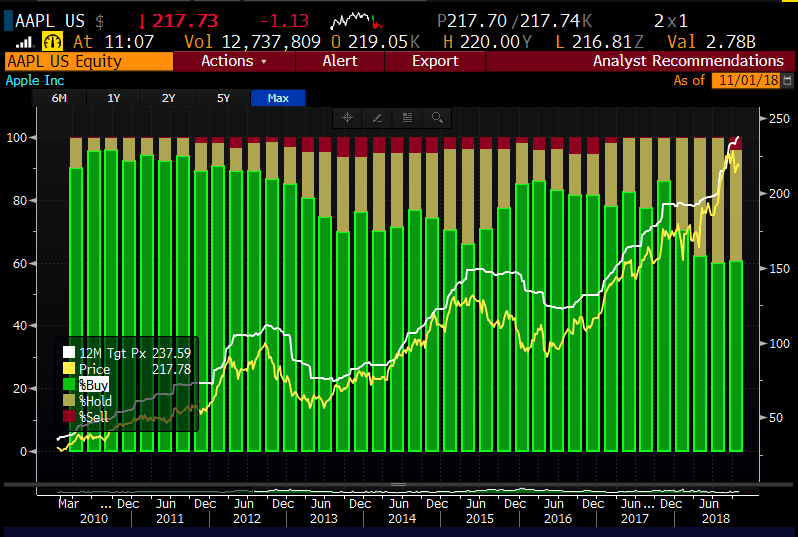 We see the stock likely continuing to outperform if iPhone units can grow in FY 19, and the stock underperforming if units are down 3% or more. 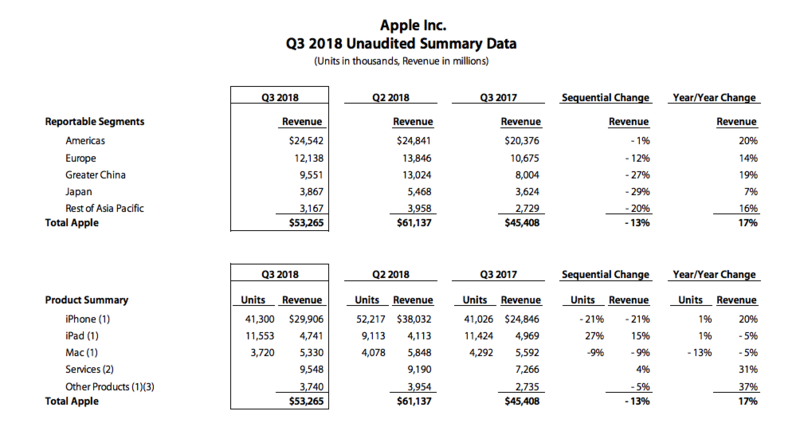 Given that we believe consensus iPhone ASPs are too low for Q4 and Q1, we believe that Apple could potentially guide Q1 in line or above consensus revenues of $92.7B (we are at $95.9B). We would view guidance for sequential revenue growth of >50% as pointing to flattish iPhone unit growth or better. So what’s my take? I suspect the company hits the guidance they gave for FQ4, despite what might be a messy iPhone unit print given the Sept 21st launch of the iPhone XS and the larger XS Max and the staggered release (Oct 26th) of their lower price large screen XR that falls in size between the XS and the XS Max. Wow, that was confusing, and there is a good chance that consumers might have waited to get their hands on the XR for $800 to see the difference between the $1000 to $1400 XS & XS Max. But I suspect any unit shortfall in the Sept quarter just ended will be picked up in the current quarter, and that guidance will be the thing to drive the stock. I suspect that guidance will be just fine. If I were writing this post a week ago, when high growth high mega-cap stocks like Amazon, Alphabet, Netflix, Facebook, and even Microsoft were in a free fall I might have suggested that anything short of a blowout beat and raise for AAPL and the stock would be on its way back to $200. Oh, what a difference a week can make. So what’s the trade? I would be surprised if the stock were to massively outperform the implied move tomorrow of about $11. And I would add that the implied move at just a tad above its historical average makes me think that those looking to express directional views can do so fairly cheaply with defined risk. The implied move of $11 means that the at the money straddle (the call premium + the put premium) in the weekly options (that expire to tomorrow) are only offered at about $5.50, or about 2.5% of the stock price. Rationale: this trade idea risks 2% of the stock price, breaking even very near the money. The options market is suggesting there is a 37% probability that this trade is in the money on tomorrow’s close. If you get the direction right there is a good chance that you will at least break-even at some point tomorrow. If the stock is up 5% in line with the implied move you can make almost double the premium at risk. Profits of up to 13.50 between 213.50 and 200 with max gain of 13.50 at 200 or below. Losses of up to 4 between 213.50 and 217.50 with max loss of 4 at 217.50 or higher. Rationale: This trade idea is slightly out of the money, and the spread is wider than the implied move as I feel that it might be a tad premature to suggest the selling the winner mentality we saw last week is over for 2018. 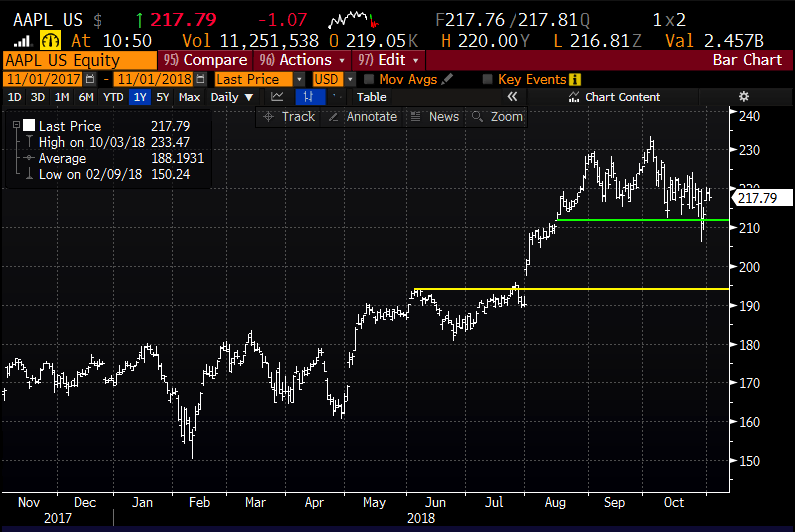 If the company were to unexpectedly guide lower, investors would shoot first and ask questions later, and the stock would very likely outperform the implied move to the downside. Profits of the stock (less $1 premium paid for collar) up to $235. The stock would be called away on Dec expiration at $235 with profits capped, but long holder could always cover the short call to keep the long stock position in place. Losses of the stock (plus the $1 premium paid for the collar) down to $205, but protected below there. Rationale: if you are long, more worried about a downdraft between now and Dec expiration, than a breakout to new highs, then this hedge idea makes sense for those looking to hold onto the position into the new year but want to define their risk to the downside.